A few hours after this year’s annual May Day march in Paris, hundreds of student protesters gathered at a small plaza in the Latin Quarter. Hoping to demonstrate against education reforms, they were quickly met by police violence. In one incident — filmed by an activist from the left-wing party France Insoumise and shared widely on social media in the following days — a group of riot police shove a peaceful protester to the ground before delivering countless blows with their clubs. Except, it turns out not all of them were cops. Last week, Le Monde reported that one of the men beating the protester was, in fact, a top-ranking security advisor to Emmanuel Macron, dressed in a riot helmet and wearing a police jacket. The news has sparked by far the biggest scandal for the French president yet, coming slightly more than one year into his term. As details continue to emerge, the affair seems to get both stranger and more damning. 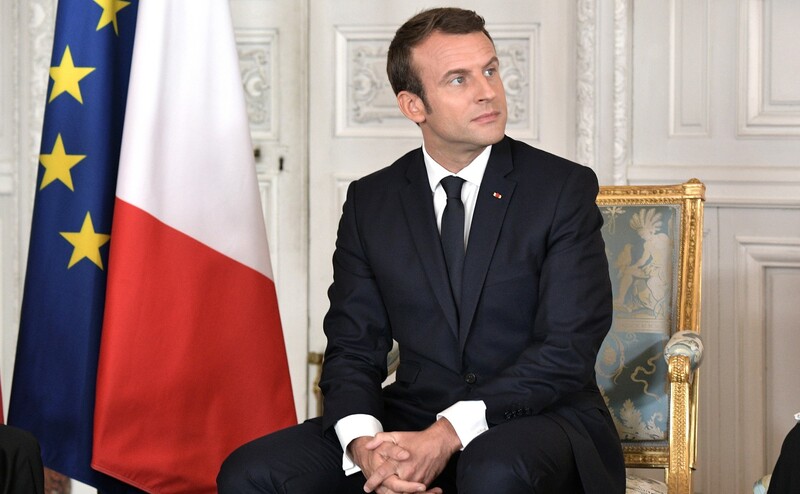 Shortly after officials from the Elysée Palace found out about the incident, the twenty-six-year-old security guard, Alexandre Benalla, was suspended. Effective May 4, his penalty amounted to just a fifteen-day suspension. Crucially, presidential officials did not notify prosecutors as the law requires of public employees if they witness colleagues committing a crime. After serving his brief suspension, Benalla was then allowed to return to security duties. He joined Macron for a ceremony at the Pantheon on July 1. He was by the president’s side during Bastille Day festivities. He even joined France’s national football team for its World Cup victory parade down the Champs-Elysées last week, two days before the scandal broke. Most stunning of all, Benalla was given a swanky apartment in the chic seventh arrondisement of Paris earlier this month. Some kind of punishment. Since the first news report surfaced, French police announced they were launching an investigation into Benalla. He was taken into police custody for questioning and now faces possible charges of “violence committed by a public official” and of impersonating law enforcement officers. Then came another twist. Shortly after Le Monde reached out to Benalla last week to confirm he was indeed the man filmed beating protesters in the Latin Quarter on May 1, the security guard allegedly contacted a top-level Parisian police official and requested video tapes of the incident. Three police officials complied with the request — they’ve since been suspended and taken into custody for questioning. One of them is a commander in charge of the liaison between police and the Elysée. Initially, the presidential palace tried to defend its handling of the situation, laughably emphasizing the harshness of Benalla’s fifteen-day punishment. Amid the avalanche of public outrage, that approach quickly proved unsustainable. On Friday, officials announced they were finally firing Benalla. In the meantime, opposition members of the National Assembly have launched a parliamentary inquiry, forcing the government to postpone its legislative agenda for the next several weeks. On Monday, they summoned Interior Minister Gérard Collomb to appear before a special investigative committee. Collomb — the face of French law and order and defender of the government’s unforgiving approach to refugees and asylum seekers — knew of Benalla’s transgressions on May 2. Why didn’t he seem to do anything about it? In a closely watched hearing Monday, he pled ignorance, saying he wasn’t aware of Benalla’s role at that time and that it wasn’t his responsibility to act. As investigations roll on, in and outside of Parliament, two central questions loom: Why was Benalla, a young security guard with no police background, given such extraordinary authority by the Elysée? Secondly, why didn’t officials from the presidential palace discipline him from the very beginning? The scandal is captivating France. On the one hand, because it’s a bizarre and juicy story in its own right. It’s easy to imagine the impact of reports about a goon from the White House or Downing Street filmed brutalizing protesters and staffers seemingly covering up the incident afterwards. While police repression tends only to concern left-wingers in France and regularly occurs without much news coverage, the added presidential intrigue made the story impossible to ignore for the mainstream press. But the affair also seems to resonate with the general public because it captures some core truths about Macron and his governing philosophy. It highlights his disdain for protesters, especially those of the left-wing variety. It displays the real meaning of his “Jupiterian” presidency, with its disdain for checks and balances. Finally, it betrays an arrogance and sense of infallibility that have come to define the former investment banker’s tenure. Tellingly, Macron hasn’t even commented on the affair yet. As opposition lawmakers demanded an explanation from the prime minister in the National Assembly, Edouard Philippe spent Friday following the Tour de France cycling race in the Southwest. He eventually commented in the presence of reporters, highlighting the importance of the ongoing investigations and criticizing opponents for using the incident for political gain. In any case, on Tuesday, the prime minister will appear before the Assembly for question time and is sure to face a barrage of questions over Benalla. The president, for his part, has refrained from acknowledging the seriousness of the scandal, apparently waiting for it to blow over. Coming from someone so adept in communication — a man who regularly tweets in foreign languages and carefully curates seemingly every public appearance, down to his “private” visits of the Taj Mahal with First Lady Brigitte — the silence is deliberate. And it hasn’t been well received by the public, more befitting of an authoritarian ruler like Erdogan or Putin than of the president of a parliamentary democracy. Macron has often criticized what he sees as roadblocks in his mandate to modernize France: pesky institutions like labor unions and NGOs that are attached, in his view, to an old and increasingly irrelevant order. By the looks of the Benalla affair, the president’s frustration extends to the ranks of law enforcement too. As other commentators have noted, the Elysée has its own special security force, the Security Group of the President of the Republic, akin to the US Secret Service. Benalla, however, was never a part of this team, serving the president as a vaguely termed “assistant to the chief of staff.” The guard was then spared the consequences of otherwise unacceptable actions because of his high-ranking position, in other words, thanks to his status as a loyal member of the presidential inner circle. This sort of special treatment is, of course, profoundly antidemocratic. Often dismissed as lefty rhetoric, this is, in fact, one of the central critiques opponents have leveled at Macron over the last year — evidenced, they say, by the president’s willingness to pass controversial laws through a fast-tracked legislative process to his proposed constitutional reforms, which would reduce the number of deputies in the National Assembly. Clearly, these critiques ought to be taken more seriously. Overshadowed by even darker developments in the United States and among European neighbors, French democracy is weathering a dangerous storm of its own. Now more than ever is the time to ask: At what point does the drive for efficiency simply devolve into the tendencies of a political strongman? If smashing trade union power wasn’t enough evidence that there is something very sinister about Emmanuel Macron’s political project, then the Benalla affair should be a wake-up call.